Home CDN , children , crafts , feature , February , holiday , holidays , homeschool , papercrafts , printables , US , worldwide February 6th - Featuring Babe Ruth Freebies! February 6th - Featuring Babe Ruth Freebies! -- George Herman Ruth, Jr. (February 6, 1895 – August 16, 1948), best known as Babe Ruth, and nicknamed the Bambino and the Sultan of Swat , was an American Major League baseball player from 1914–1935. 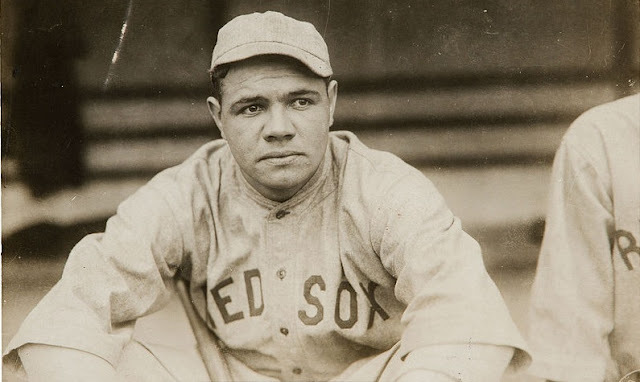 Ruth originally broke into the major leagues with the Boston Red Sox as a starting pitcher, but after he was sold to the New York Yankees in 1919, he converted to a full-time right fielder and subsequently became one of the league's most prolific hitters. Ruth was a mainstay in the Yankees' lineup, winning seven pennants and four World Series titles during his tenure with the team. -- Babe Ruth lived a life of journeys and itineraries — from uncouth to couth, spartan to spendthrift, abandoned to abandon; from Baltimore to Boston to New York, and back to Boston at the end of his career for a finale with the only team that would have him. There were road trips and hunting trips; grand tours of foreign capitals and post-season promotional tours, not to mention those 714 trips around the bases. Drawing from more than 250 interviews, a trove of previously untapped documents, and Ruth family records, Jane Leavy breaks through the mythology which has obscured the legend and delivers the man. • Babe Ruth No Fear - Retro Tin Sign -- The tin sign is just one the hundreds of high-quality wall décor products offered to help you decorate in your own unique style. Items like Babe Ruth No Fear - Retro Tin Sign enhance any interior and match your budget and style! - This holiday is about bringing awareness to those who have not yet tried frozen yogurt by making some homemade and sharing it by way of a yogurt party. Yogurt parties can be nice little quiet parties just between family or it can be a real big yogurt party full of many varieties of yogurt to sample and enjoy! - On February 6th, National Lame Duck Day recognizes the ratification of the 20th Amendment to the United States Constitution or the Lame Duck Amendment. The term lame duck originated as a description of stockbrokers in 1700s England who could not pay off their debts. The name later carried over to those in business who, while known to be bankrupt, would continue to do business. - Compliments are a simple, yet powerful, relationship building tool. There are many different reasons to give a compliment. The most compelling - it makes you feel good. You cannot give a sincere compliment without feeling great. It is impossible. Why does it feel so wonderful to pay a compliment? Because you are connecting honestly, directly, and kindly with another human being. It is a basic need which doesn't get met often in our fast-paced, media-hyped, negative-slanted, technical world. Created by Adrienne Koopersmith, on February 6, 1995. - Celebrates and honors all girls and women participating in sports. Recognizes the passage of Title IX in 1972, the law guaranteeing gender equity in federally funded school programs, including athletics. Sponsored by Girls Incorporated, the Girl Scouts, the National Association for Girls and Women in Sports, the National Women’s Law Center and the Women's Sports Foundation.